What's Local? leverages data from the USDA 2012 Census of Agriculture to explore local food systems for the 100 most populous urban areas in the lower 48 states. “Local” is defined as all counties having land within a 50-mi radius of each urban area’s center point. Data are presented in two categories: 1) resource inputs, shown as dollars invested, and 2) agricultural outputs, shown as the mass of food, feed, and fiber produced in megagrams. 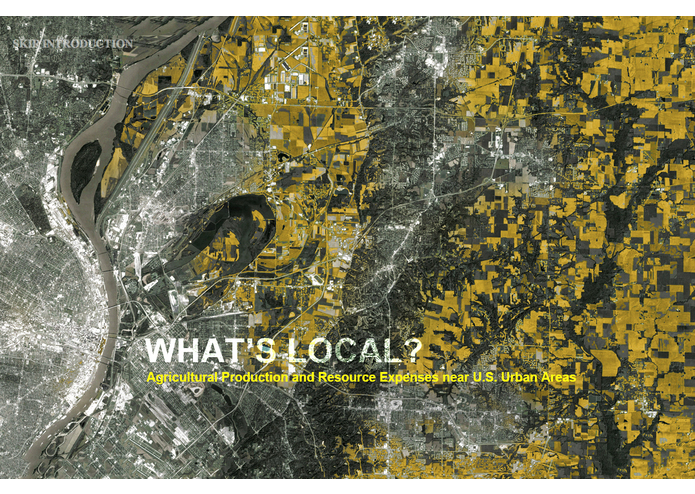 Explore your city’s local agriculture in comparison to other locations around the nation. This tool can help us envision the potential for, desirability of, and major challenges to future food system localization. What's Local? starts with an introductory sequence that establishes the project narrative and educates the user on relevant landscape patterns across the nation. This intro can be skipped if desired. The introduction leads to an interactive visualization tool. 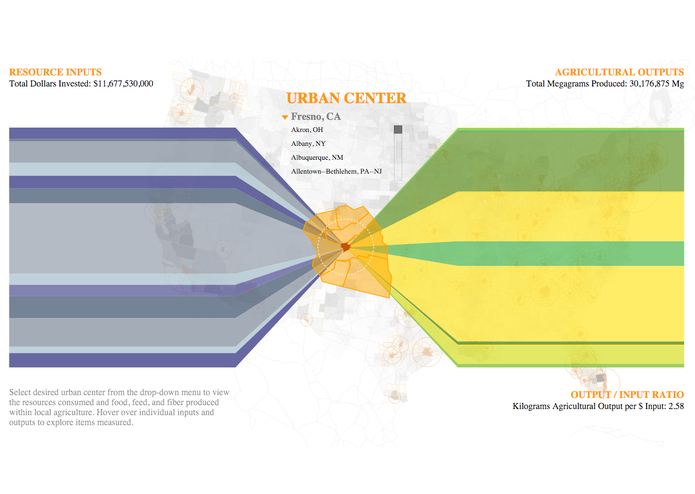 Leveraging data from the USDA 2012 Census of Agriculture, this visualization allows the user to explore local food systems for the 100 most populous urban areas in the lower 48 states. “Local” is defined as all counties having land within a 50-mi radius of each urban area’s center point. Data are presented in two categories: 1) resource inputs, shown as dollars invested, and 2) agricultural outputs, shown as the mass of food, feed, and fiber produced in megagrams. For the latter, raw data available from the census were transformed to a common unit of mass using conversion factors based on USDA reports. All methods and data sources are thoroughly documented in the “DataSourcesMethods.docx” file linked on the project website (also copied in below). The user can explore an interactive map of the lower 48 states that allows nationwide visualization of: a) county-level aggregated data (grey shades), and b) data for 100 urban areas and their local agriculture (circle sizes). These data layers can be selected by the user at the bottom left of main visualization page. The user can also select and zoom in to specific urban centers to explore their local agriculture. Hovering over inputs and outputs shows census items measured, and comparison of urban centers is facilitated by an option to switch between locations while staying in the zoomed-in format. Clicking on the background national map returns the user back to the national view. 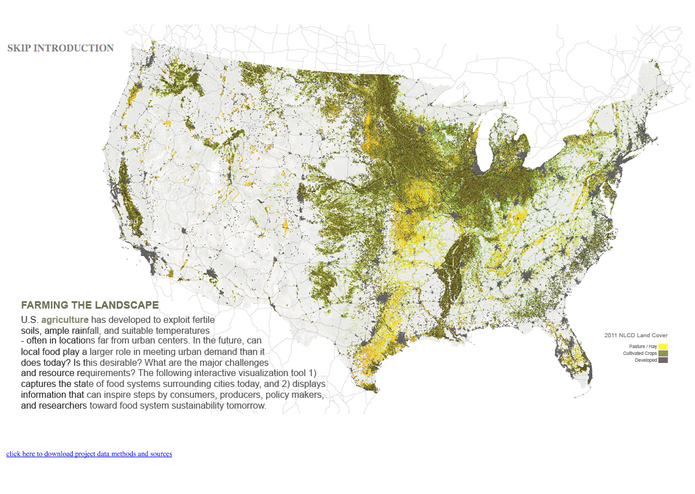 With this tool, consumers can gain a deeper, data-based understanding of what’s happening in their local food systems, and policy-makers and researchers can easily explore the heterogeneity in agricultural inputs and outputs near urban centers across the diverse U.S. landscape. Soil Productivity Index, developed by the USDA Forest Service. More information is available here: Schaetzl, R.J., Krist, F.J., & Miller, B.A. 2012. A Taxonomically Based, Ordinal Estimate of Soil Productivity for Landscape-Scale Analyses. Soil Science 177:288-299. PRISM Climate Group, Oregon State University, http://prism.oregonstate.edu, created 26 Oct 2015. More information is available here: Homer, C.G., Dewitz, J.A., Yang, L., Jin, S., Danielson, P., Xian, G., Coulston, J., Herold, N.D., Wickham, J.D., and Megown, K., 2015, Completion of the 2011 National Land Cover Database for the conterminous United States-Representing a decade of land cover change information. Photogrammetric Engineering and Remote Sensing, v. 81, no. 5, p. 345-354. "Local agriculture" for each urban area includes all U.S. counties having land within a 50-mi radius of that urban area’s center point. Some counties are shared by multiple urban centers due to their close proximity. 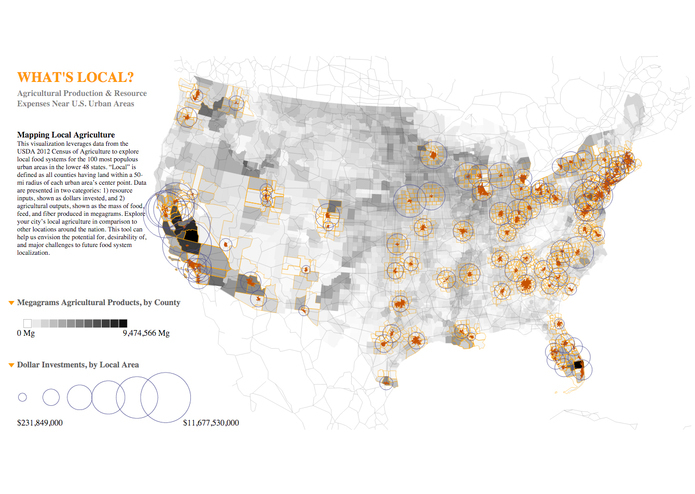 All data for these shared counties are visualized for every proximal urban center. The mean national price of food size or market size catfish reported in the 2013 Aquaculture Census was $0.99 per LB. Using consumer price indices from the U.S. Bureau of Labor Statistics for meat, poultry, fish, and eggs (July 2013 and July 2012), it was estimated that the mean price of catfish in 2012 was $0.97 per LB. Therefore, it was estimated that 1.03 LBS of catfish were produced for every dollar in sales in 2012. The weighted average national price in 2013 ($3.10 per LB) was estimated based on food size or market size prices and total values reported for bass, carp, tilapia, and other food fish in the 2013 Aquaculture Census. Using consumer price indices from the U.S. Bureau of Labor Statistics for meat, poultry, fish, and eggs (July 2013 and July 2012), it was estimated that the mean price in 2012 was $3.04 per LB. Therefore, it was estimated that 0.33 LB of fish in this category were produced for every dollar in sales in 2012. The price of milk per LB in 2012 was estimated using total gross value of production data from the USDA ERS Commodity Costs and Returns database. These data were available by ERS Farm Resource Region. Therefore, values of milk produced (LBS) per dollar in sales (range = 4.32-5.23) were assigned to counties based on what ERS Farm Resource Region they are part of. When data were not available for a Farm Resource Region, the U.S. national average (4.72 LBS milk per dollar in sales) was used. Mathews, K., & M.M. Haley. 2014. Livestock, Dairy, and Poultry Outlook. USDA ERS. Situation and Outlook. LDP-M-245. 11/7/14. Mathews, K., et al. 2015. Mandatory price reporting, market efficiency, and price discovery in livestock markets. USDA ERS. LDPM-254-01. September 2015. NASS, Agricultural Statistics Board, USDA. Poultry – Production and Value 2012 Summary. Released April 29, 2013. State-level mean weights were applied to all counties within a given state. When no data existed for a state, the value for “other states” (5.809 LBS per head) was applied. Note that only 3.5% of chicken LBS nationally do not come from broilers (“chickens lost, sold for slaughter”). Therefore, only broilers were considered in the visualization. State-level mean weights were applied to all counties within a given state. When no data existed for a state, the value for “other states” (32.689 LBS per head) was applied. USDA ERS. 1992. Weights, measures, and conversion factors for agricultural commodities and their products. Agricultural Handbook Number 697. State-level conversion factors were applied to all counties within a given state. When no data existed for a state, a conversion factor was estimated based on those existing for neighboring states. The conversion factors ranged from 6.581 LBS fruit & tree nuts per dollar in sales (Florida) to 0.588 LBS fruit & tree nuts per dollar in sales (New Mexico). Vegetables were treated as a single aggregate class. State-level conversion factors (LBS per dollar in sales) were estimated using 2012 data for total vegetable production in cwt and total vegetables value in dollars, provided in the USDA NASS Vegetables 2014 Summary, released January 29, 2015. State-level conversion factors were applied to all counties within a given state. When no data existed for a state, a conversion factor was estimated based on those existing for neighboring states. The conversion factors ranged from 12.07 LBS vegetables per dollar in sales (Illinois) to 1.6129 LBS vegetables per dollar in sales (New Hampshire). Ackerman-Leist P. 2013. Rebuilding the foodshed: how to create local, sustainable, and secure food systems. White River Junction, VT: Chelsea Green Publishing. Balogh S, Hall CAS, Guzman AM, et al. 2012. The potential of Onondaga County to feed its own population and that of Syracuse New York: past, present, and future. In: Pimentel D (Ed). Global economic and environmental aspects of biofuels. Boca Raton, FL: CRC Press. Cleveland, DA. How does food localization contribute to food system sustainability? Front Ecol Environ 13: 410-411. Desrochers P, and Lusk JL. 2015. The inability and undesirability of local croplands to meet food demand. Front Ecol Environ 13: 409-410. Edwards-Jones G, Canals LM, Hounsome N, et al. 2008. Testing the assertion that ‘local food is best’: the challenges of an evidence-based approach. Trends Food Sci Tech 19: 265-274. Peters CJ, Wilkins JL, and Fick GW. 2007. Testing a complete-diet model for estimating the land resource requirements of food consumption and agricultural carrying capacity: The New York State example. Renew Agr Food Syst 22: 145-153. Peters CJ, Bills NL, Lembo AJ, et al. 2009. Mapping potential foodsheds in New York State: a spatial model for evaluating the capacity to localize food production. Renew Agr Food Syst 24: 72-84. Zumkehr A, and Campbell JE. 2015. The potential for local croplands to meet US food demand. Front Ecol Environ 13: 244-248. I was the developer on a team consisting of myself, an ecologist, and a designer.